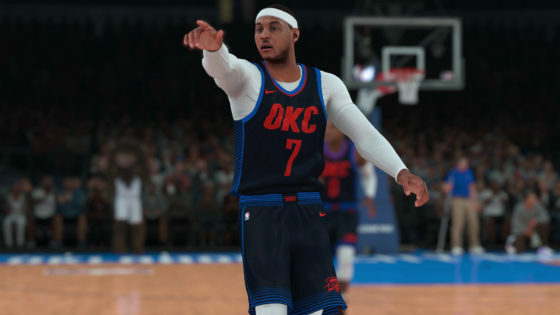 Newly signed Houston Rocket Carmelo Anthony penned a letter to the Oklahoma City franchise, its players, owner, and fans of the Thunder, thanking them for their support in the 2017-2018 season. Anthony, a future Hall-of-Fame player, appreciated working in the city for a year and was gracious in his words that were released today. In looking at the classiness that “Melo” showed today, one must wonder why a past super-star that wore the Thunder colors for the better part of his early career, Kevin Durant, did not do the same a few years ago when he bolted for Golden State and the chance to win titles with a team that he battled with rigor with his OKC teammates. I guess some people in sport have it (tactfulness and graciousness) and others not so much. “I know it was only one season, but from the time I arrived in OKC, I was greeted with so much love from The Team, The Organization, and of course the INCREDIBLE fans of this amazing city. Throughout the entire season, game after game, you cheered me on and rooted for us as a team. That is something I will always cherish and never forget. That genuine support kept me going all season long. “IN LIFE, I’ve learned that things don’t always turn out how you want. I wanted nothing more than to make it work here & help bring this city a championship. I’m sorry it didn’t work out while I was here. “Thank you to Russ, PG, Sam Presti, Coach Billy Donovan, my trainers and the entire staff who work so hard and diligently at Chesapeake Energy Arena and the practice facility. I appreciate you all very much. Last but not least, Thank You to (Thunder part-owner and chairman) Mr. (Clay) Bennett for believing in me. “This chapter of my career may be coming to an end but my story is far from over. I respect you Carmelo. If KD had a letter like yours, there wouldn’t have been so many hurt feelings! He just crawled out in the middle of the night. The difference is, you have class!! Wishing you the best always! totally agree Suzanne…you hit it on the head.